The average of the profit factor of the darwins with D-Score>75 is 1,52. 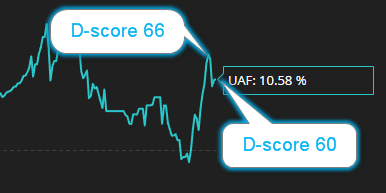 There's no correlation between profit factor and D-Score (0,05), so you can say hte higher profit factor, the better. Another rule you can set is VaR underlying strategy<25 (all darwins with D-Score>75 have VaR<25 except NSC and OSM). I think CavaliereVerde's rule should be mandatory: do not invest in darwins with return> 5% in the last 3 months. Another mandatories: divergence>-0,50 and a minimum capital (>50000). There are clearly two types of good darwins (high La and Cp; high Os and Cs and low Cp), so I don't trust darwins that don't fit into one of these types. Examples: STV, FEG, THA, HFD, BPX, QUA, OLE, ICX. I'm sure I forget some mandatories and this portfolio needs exit rules. As you can read in other disussions, studies on exit strategies are in progress. Could be interesting may be to add Return/Risk >=1 to filter a bit more? That's right! It is on the list of new filters to be developed on the next iteration. 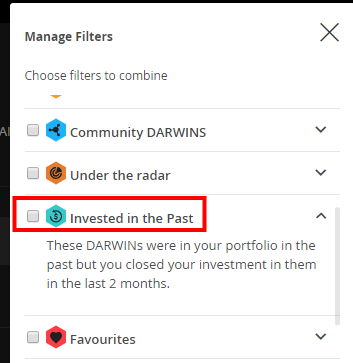 Also, maybe add "invested in the past" filter? It helps a lot if you want to adjust your portfolio often. I found D-score very volatile whereas Ex is near 10/10. Pf dropped of a few percentages and Dsc falls 66 to 60. Pf is THE big attributes of the D-score. Also, what is the performance attribute Pf ? You are confusing the past with the future. So his trading is much better NOW than when he experienced the 41% DD . With all due respect just look at the monthly returns. Not for an investor or trader like me. Minus 23% after 14 months means work on your strategy and come back when you've fine tuned it. But hey he's gonna get an allocation this month, so great! I didn't confuse anything, I looked at his equity curve and just knew that the returns are too volatile and inconsistent. 41% DD on a DARWIN means it could very well happen again, unless strategy or psychological regulation is improved. And thanks for moving this thread where it belongs. Many traders have the bad habit to tailor and optimize their incepition. Too many trackrecors stars on a low. Publication bias is the rule here and on every social investing site. Not the case of JOC . You have to optimize your strategy not your inception. DScore prizes your present not your past. But this could be just luck, I think. I don't know, the track record is very small for my taste. Also, too much red in it. Ther was a lot of red also in UEI in October 2016 and a DScore of 70 . Often DScore is a leading indicator. On the other side many "green" darwins are just sideways stuff wisely cut to start on a low. As far as I know, 3 d-period only weights 7%. 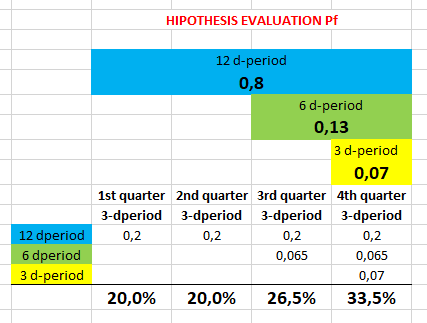 In my opinion, to reduce the volatility of pf, we need to evaluate it in periods higher than 12 dperiods, specially in darwins with short dperiods. Completely agree with La, but I don't know how it works the way of calculation. I was also trying to get it, and I was not able to. That would be the second step but it would require to revoutionize the whole concept and consider everything on 24 dperiods. The point is that this DScore is too volatile, in this way it is a good tool to find promising stuff to incentivize with Darwinia but it is completely useless as a fundamental to invest. An averaged DScore on 12 months would be more significant than this one. In this way that 7% is an extra weight because the percentile of 12p and 6p is already influenced by the percentile of 3p. Yes I know, attached the weights of every quarter shared proportionally. I agree that it would improve, but I am not sure if it could solve fully the problem, without increasing the space of evaluation. It could be checked. I was thinking to 0.15 and 0.05 but that is the point ! Nobody needs a Pf more volatile than Return. Noisy Pf -> noisy DScore ->noisy filters and rankings. BTW Loss Aversion is even more flawed than Performance and is also often correlated to Performance!